This body of work is focused on the species most affected by acid deposition in the northeast United States and southeast Canada. 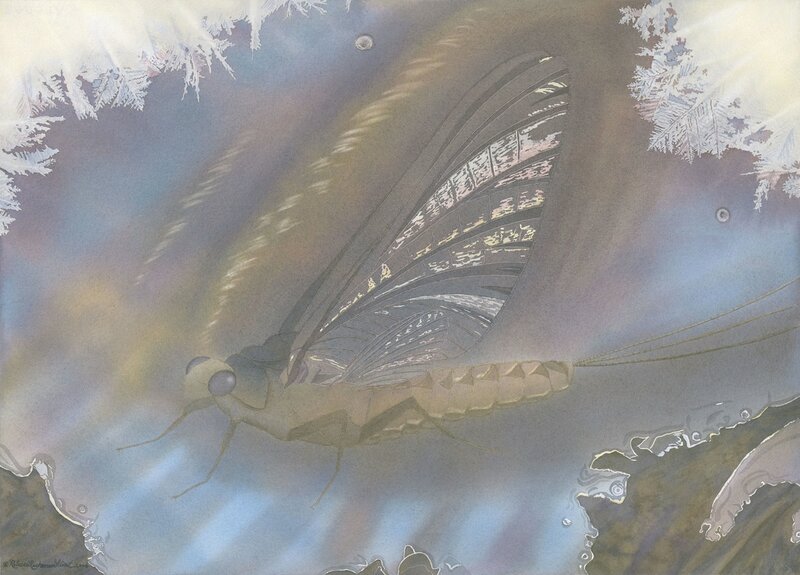 The expression of viable relationships between life forms, aquatic systems, clean air and precipitation is key to the positive theme in the series. The originals are now home in the Adirondacks, part of the permanent collection at The Adirondack Museum in Blue Mountain Lake, New York. Prints of each image are available. ​This painting was born to bring focus to the relationship between aquatic species and their homes – our lakes, ponds, rivers, and streams. These systems are vitally important to fish, and countless other life forms like insects, salamanders, and mussels. Trout not only depend on healthy aquatic systems, but people do as well. Water is one of the most basic elements to support life on earth. See this strong male brook trout and his reflection sparkling in the ripples. Feel his connection to the water. He is one with his home. 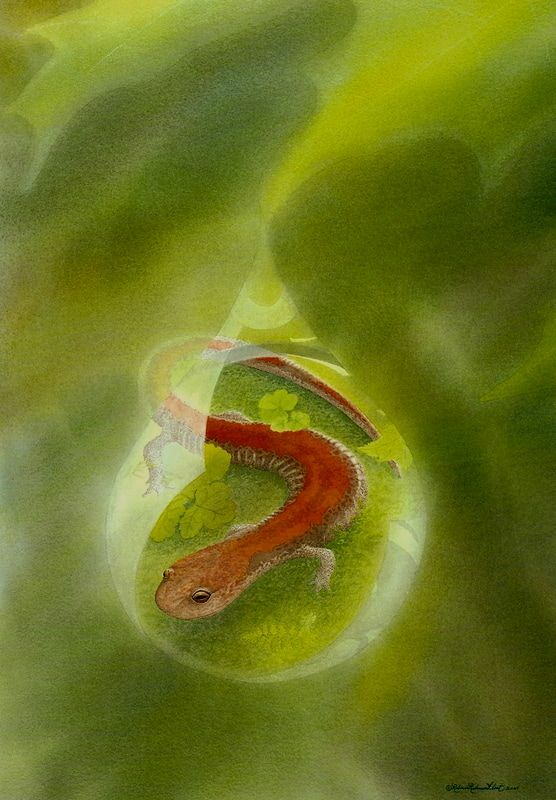 ​The red-backed salamander is a sensitive inhabitant of our natural world, and its recent population decline can tell us about the viability of our eastern forests. Acid rain is affecting the homes of these tiny beings; creatures who are helping us to educate people and stop pollution. Each drop of water falling from the sky should be pure and clean and sparkling! ​Common loons are the subject of critical research involving mercury. They are important biological indicators of the health of our northern forests and aquatic systems. In this painting, I bring attention to the connection of loons to the water and fish on which they depend. As you look closely at the reflection on the water, you see yellow perch, one of the bird's primary food sources. Loon populations reflect the viability of their environments and these relationships are key. Please join me in celebrating our beloved loons! ​As we look deep within the essence of a sugar maple, we see trees reaching endlessly skyward. 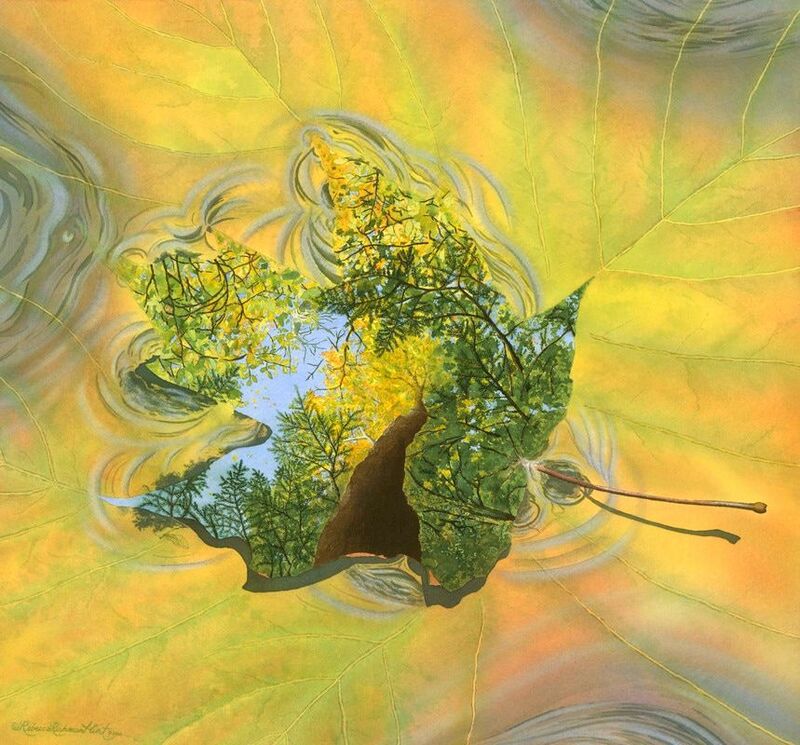 The leaf reflects the viability of its source, the towering sugar maple tree. Its neighbors, the hemlock, beech, and birch trees, are part of the dense canopy that shades sugar maple seedlings, nurturing the young trees' growth. In boreal forests, populations of sugar maple have declined due to acid rain. This pollution not only impacts our natural areas, but also local economies that depend on the production of maple sugar and wood products. As we think about our natural and human communities, let's ensure the health of our forests. Precipitation should nurture our soils and trees, just like the gorgeous fall colors nurture our senses. 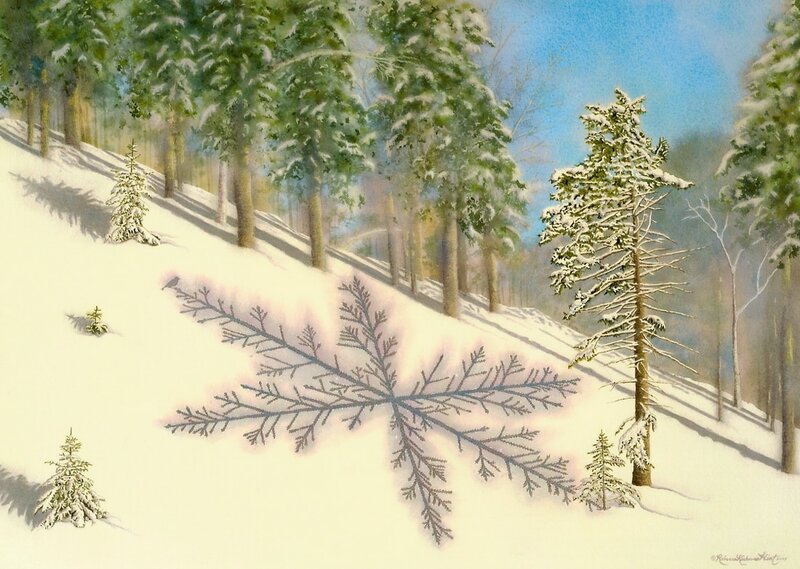 ​In the foreground of this painting are five red spruce trees. It's a peaceful winter day and the snow shimmers gold with the rays of the morning sun. The shadow of one young tree is a massive snowflake, structured from limbs of a red spruce naked of needles yet just about to bud new growth. A rare Bicknell's thrush is perched on the snowflake toward the light to see what the future holds for our precious forest. The large red spruce in the foreground has no shadow to symbolize that we can heal past damage caused by pollution. We now look forward to a new relationship with nature. As you view this painting, see the relationship between the Bicknell's thrush and the high alpine forests of the Northeast. Instead of being impacted by acid deposition and mercury pollution through fog and precipitation, the cloud moisture should be clean and pure in this bird's mountain top home. A male thrush looks on from his red spruce perch and sings, looking forward to a bright future. Let's focus on clean air and water, and viable populations of Bicknell's thrush. Let's recreate the natural balance for people and all creatures on earth. ​Imagine viable populations of mayflies and trout. Imagine clean, pure snow melting into our rivers and streams each spring. Imagine the web of life within each ice crystal, snowflake, or frozen stream surface; a web that is connected by weather, water, bugs, trout, and people. Our thoughtful choices can make these relationships healthy again, abating the threat of pollution forever and returning to a time of clean skies and pristine waters.